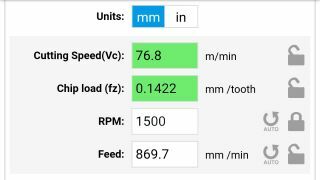 we used to be able to edit the Chip load, RPM and feed in the results directly in older versions (before UI update). Now this functionality is gone and I can only use those sliders (which, with 10% increments is quite unprecise). I can tap the fields and enter a value, but on pressing enter, the fields simply default back to the prior calculation result. Is this behaviour intended, or is it a mere oversight of a bug? The only field that is directly editable is "Vc". Say, the resulting RPM are 834 but my machine only has 600 and then 1000, then I'd choose 600, enter 600 in FSWizard and it would calculate/correct the other values accordingly. [list=1][*]Assume all results fields were green (e.g. Initial calculation result = Auto-calculated). Of course, all fields would be reset on change of any tool or material parameters. There, a simple "padlock"-button next to a result field could lock this value, so not everything is reset on a small tool change. I've attached a little picture of how I would envision that exactly. Let me know what you think, I hope it wasn't too long to read. Thank you very much for reporting the issue. This is definitely a bug and it affects things only in metric mode. I will fix it today and roll out an update. Thank you also for the suggestion. Right now it works(or at least supposed to) exactly like you described, but in order to reset the field to default, one must tap its label. No need to manually enter 0 value. I've seen you haven't pushed the update as of yet. Might I ask one more little favor? Could you please add "L2 Tool Steel" to the materials database? It is very widely used in Europe (widely known as "Silberstahl e.g. Silver Steel" or Böhler K510. In fact, I don't know of a singe machining shop, that doesn't use it. The European Material number is 1.2210 and for AISI it's L2. I have just issued a release that fixes the bug you reported. The material addition will be done in next update because it first has to go through HSMAdvisor. I'm afraid I have to report, that you didn't fully fix the bug. It works properly for most tools but it doesn't work for drill-like tools like twist drills or reamers. I will tackle it this weekend. It seems that v1.522 fixes the issue. Let me know if you find something else wrong. I've even deleted the Cache and App Data and redownloaded the 1.522 update to no avail. 3. It changes to an arbitrary number more or less in the range of what i entered, but always around 100-300 above or below. I am using metric values all the way through. By the way: Any news regarding the implementation of L2 Tool Steel? A couple of days ago i uploaded the fix and added the L2 material. It seems to work now. Thanks a lot!